Written by Fred Patten, and intended for Apa L, 2198th Distribution, LASFS Meeting No. 3646, June 28, 2007. Michael Burlake brought me to last week's LASFS meeting. We had not even gotten my wheelchair out of his minivan when Doug Crepeau showed me a printout of my photograph from that day's Los Angeles Times, in its Column One article, "In a University Not Far Away, Sci-Fi Heaven", on the history of the Eaton Collection at the University of California at Riverside's Library. Aside from the "sci-fi" and misspelling of my name as Patton (which the Times corrected the next day), it was a very nice article on how the collection came to be. Christian McGuire announced the article at the beginning of the meeting, but not that my photo was in it. Walt Daugherty got a long obituary that seemed to emphasize that we knew he had been a Very Important member very long ago, but nobody today was sure why. It was announced that the Space Station would pass overhead near Venus around 9:40 p.m. I had gotten an e.mail the day before from a Winston Jackson asking for some specific information about the 1980 San Diego Comic-Con, so I asked Marty Cantor to get out the August 1980 Apa L dist'ns and photocopy my Comic-Con report in ¡RR! #795, which had some helpful details. Michael Burlake found that novel about the extinction of life on Earth through the destruction of all cellulose, with Furry aliens, in the LASFS Library (The Alien Dark, by Diana G. Gallagher) and checked it out for me to reread. Jerry Pournelle reviewed Ratatouille as not expecting to like a movie featuring a rat, but the movie won him over anyway. (The combined critics' ratings for Ratatouille at the Rotten Tomatoes website is 100% favorable.) The program was a discussion on "unpopular scientific concepts", which it certainly was; people were screaming at each other over the "expanding Earth theory" when Michael & I left, a little earlier than usual to look for a dark street so we could see the Space Station pass by overhead. Michael got a good view of it ("like an airplane without the blinking lights"), but it went right over the minivan which I was inside. I could see Venus clearly, though. When I got back into my hospital bed and turned on my laptop, I looked up the "In a University Not Far Away" article while the June 21st issue of the Times was still currently online, and saved it. This may be a little tough for some people to watch. In 1988, there was a tour called "Together Again" with Frank Sinatra, Sammy Davis Jr and - briefly - Dean Martin. It was supposed to be the three of them for the entire run culminating in a big performance taped for HBO...but after a week or so, Dean was gone, the HBO taping was cancelled and Liza Minnelli took his place for the remainder of the tour. There are many stories about what happened - tales of Dino and Frank getting angry at each other - but clearly the underlying problem was that Dean wasn't Dean. His heart certainly wasn't in it. It was less than a year since his son Dean Paul had been killed in an air crash, and friends of the family said Dad just never recovered from that loss. Beyond that, his health and voice were poor. He did the performances he did, and several press events, with an attitude of "Why are we doing this?" This clip purports to be the last ten minutes of Dean's last appearance on that tour. I don't guarantee that's so but he sure looks like a guy long past the time he should have retired. I suppose you can view this video - if you view it at all - one of two ways. It could be a sad spectacle of Dean at an age where he was just too old to be Dean Martin. Or it could be a testimony to the fact that his stardom and natural charisma would carry him through a performance. I imagine some in the live audience were willing to forgive his faltering and others weren't, especially considering the ticket prices. Fish Out of Water #228 - (Helgesen) The official abbreviation of the County of Los Angeles Public Library is just "the County Library". This seems a bit confusing to me when trying to describe the library to someone unsure of where I am talking about (which County? L.A.? Orange? San Diego? ); also slightly misleading since both 'the LAPL" and "the County Library" are Los Angeles-area public libraries with many branches. The Moffatts should be able to find branches of the L.A. County Library near them, whereas I don't know how close their nearest branch of the Los Angeles [City] Public Library might be. The city of Downey, where they live, has its own public library which is not too large. Godzilla Verses # 145 -- (DeChancie) I learned while searching for online information about Brick Bradford that someone has built a, unfortunately not working, Time Top: "Before his death from cancer, the late Canadian artist Jerry Pethick (1935 - 2003) conceived a large bronze sculpture in the shape of the Time Top as it was depicted in later installments of the Brick Bradford strip. In 2004, his widow, Margaret Pethick, took over the project. It was submerged in sea water for two years, connected to an electrical source, to accelerate barnacle and mineral accretion on its surface, giving it an aged look. In August 2006 the sculpture was installed on its permanent site at False Creek, Vancouver, British Columbia." ## But fandom encompasses everything that a fan may be interested in. ## I do not know if editors still recommend the use of Terra, Luna and Sol in stories to be taken seriously as s-f. According to the recent biography of Ed Emshwiller, s-f illustrator par excellence during the 1950 and early 1960s, Emsh wanted to make many of his covers more modernistic and abstract, but he was ordered by his editors to depict "photorealistic scenes" of the future &/or fantasy. Vanamonde #735 - (Hertz) The Lackadaisy comic strip is set in 1927, not the 1940s. Were boutonnières more prevalent in the '20s? I am trying to remember whether George Raft or any of the gangsters wore one in Some Like It Hot. On the other paw, the artist of Lackadaisy has acknowledged some anachronisms such as drawing some of her '20s characters in '40s zoot suits, just because she likes zoot suits. But looking at the strip more closely, boutonnières seem to be a uniform worn by the Marigold bootleggers. All of that gang wear boutonnières, and none of the other Lackadaisy characters do. De Jueves #1536 - (Moffatt) Pibgorn downloads without trouble on my computer. ## Yes, the Golden State Convalescent Hospital checks me for sores of any type every day. A "wound specialist" says that I am improving marvelously, although it may be another month before I am well enough to leave the hospital for longer than the 2 ½ hours once a week to the LASFS meetings. ## Read my review of Huff's The Heart of Valor on The Flipbook website. It is the third novel in Huff's Confederation series from DAW Books. Read A Confederation of Valor first, which is a reprint of the first two novels. ## I would not go out of my way to buy blood pudding, but I did not dislike it enough to not eat it as long as we had paid for it. It was better than £12.00 for a sliced boiled tomato, which was the "gourmet" breakfast at our hotel that Jim Groat & I turned down. The only other eatery that we could find in Glasgow open that early in the morning was a tiny greasy spoon serving a no-substitutes workingman's breakfast which included the blood pudding along with a fried egg, bacon & tea for only £3.00 or £4.00. One of my fondest memories of the 1995 Worldcon is of Groat trying to get the cook to tell him what the "black pudding" was made of, which the cook was dancing around because he knew that Groat would not eat it if he knew. "You 'Merican tourists never do," he said after he was pinned down. I was very amused since Groat spent so much time working on his "manly man" image. It tasted rather like an oatmeal cookie, as I recall, logically since it was mostly oatmeal soaked in pig's(?) blood. Toony Loons #47 - (Zeff) I used to read the present Annie artist Ted Slampyak's independent comic book Jazz Age Chronicles in the early 1990s (which, come to think of it, was a lot like Lackadaisy with a human cast instead of anthropomorphized cats). It was much better than Annie, but probably did not pay nearly as well. Slampyak is following Leonard Starr's modernization of the Annie characters, doubtlessly at King Features' orders. ## For the quintessential Bat Durston novels, read Steve Perry's Stellar Ranger and Lone Star. I do not know if they are in the LASFS Library. I Evaluate Vampires - (Gold) In any case, I doubt that my sister Sherrill would have ever heard of ConChord 20 if not for you, and now she is planning to attend at least one day of it. ## Probably the story about Walt Disney being an illegitimate part-Spanish child would have not become an urban legend for Snopes to debunk if it were not for Marc Eliot's Walt Disney: Hollywood's Dark Prince biography, which is one of those that the animation scholars have torn apart. Eliot is cited as a reliable source for the Disney in Deutschland play in San Francisco that I reported last week. That play's author, John J. Powers, has been "rebutting" his reviewers' attacks on their websites this past week, but his rebuttals consist of little more than repeating "everybody knows" that the claims in his play are true, and "you obviously haven't read" the Eliot and Mosley biographies if they don't know about Disney's "proven" anti-Semitism. Powers' comments make it clear that he did not write Disney in Deutschland in honest ignorance that the books claiming Disney's anti-Semitism have been disproven; he is deliberately ignoring all criticisms of them. Harry McCracken quotes Powers as writing to him, "No one but you seems to be suggesting Mosley's factual errors. If you could bother to cite them and back up what you say that would be different." McCracken replies with a long list of errors, such as naming the live-action The Incredible Journey as one of Disney's animated features, and naming Freddy Moore, one of Disney's most famous animators in the 1940s (caricatured as Lampwick in Pinocchio), who was killed in an auto accident in 1952, as the animator of Maid Marian in Disney's Robin Hood feature of 1973. Reviewers of Mosley's book have pointed all of these out ever since it was published in 1985. "NONE OF THESE HAVE BEEN REFUTED BY THE DISNEY ORGANIZATION", says Powers, which may be technically true in that the Disney Organization never officially comments on the accuracy of any unauthorized biographies; but lots of Disney animators have individually debunked them. Mike Barrier quotes Powers as saying, "Until his death in 1966 no Jews or blacks were allowed to be employed at any Disney facility: that is a matter of record." Practically every book about Disney that starts before Mickey Mouse has named Isadore "Friz" Freling as one of Disney's first employees in Kansas City, who followed Disney to Hollywood and was one of his main animators there until he became one of the Oswald, the Lucky Rabbit animators who deserted Disney in 1927. Freleng went on to become one of the first animators of the Leon Schlesinger/Warner Bros. studio. He was so obviously Jewish that when his self-caricature was animated as one of the gremlins attacking Hitler's plane in Russian Rhapsody, WB got complaints about its "Nazilike" exaggerated Jewish-caricature gremlin. Oskar Fischinger, the abstract artist & filmmaker who left Germany in 1936 due to his being a high-profile Jewish artist, worked on Fantasia and Pinocchio. Art Babbit, the animator who established Goofy's on-screen personality and who animated the Wicked Queen in Snow White and Geppetto in Pinocchio, was Jewish. Others have pointed out that during the late 1940s and 1950s, Hollywood gossip columnists reported several society events attended together by the Disneys and the Goldwyns, and there was hardly a more evident Jewish studio boss in Hollywood than Samuel Goldwyn. Floyd Norman, a black Disney animator hired during the 1950s, has been personally refuting for years the charge that Disney refused to hire any blacks, and naming other black animators at the studio before Disney's death; but the anti-Disney supporters of the Eliot and Mosley biographies just ignore him. Oh, All Right!!! - (Lembke) To me, any scanner technology more recent than 1990 is brand new. Where was it when we needed it for LASFS fanzines during the 1970s? 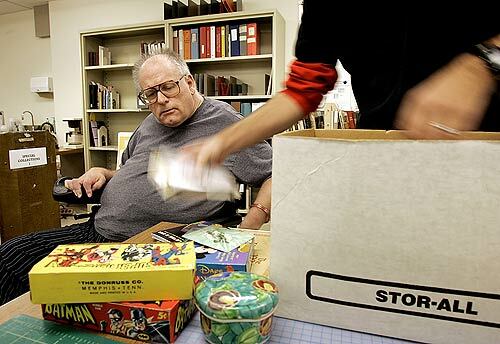 Fred Patten, left, watches as a worker sifts through some of the items he gave to the Eaton collection library at UC Riverside. Patten donated 900 boxes of comic books, tapes and records to the collection.